With three new council members weighing in for the first time, the Hawaii County Council on Wednesday is scheduled to decide whether to appeal a federal court ruling overturning the county’s ban on growing genetically modified crops in open-air conditions. West Hawaii Today. 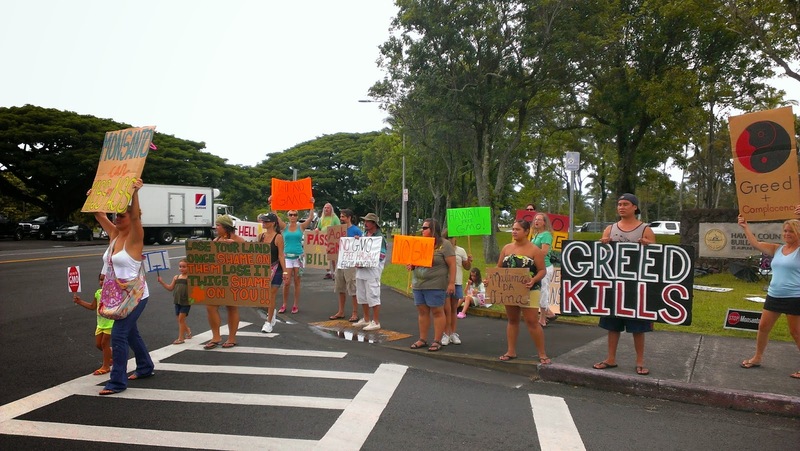 The authors of a new Maui law banning the cultivation of genetically modified organisms won standing on Monday to intervene in a federal lawsuit challenging the measure. Michael Carroll, an attorney for the group SHAKA Movement, said Magistrate Judge Barry Kurren's ruling will allow his clients to file their own motions and to respond to motions filed by the plaintiffs. Associated Press. Gov. David Ige’s burgeoning administration is following in the footsteps of Gov. Neil Abercrombie when it comes to resisting the release of certain state board members’ financial disclosure statements. State lawmakers unanimously passed a bill in April adding 15 boards to the list of those whose members must annually disclose their financial interests. Ige, a member of the Senate at the time, also voiced support for it in his campaign for governor. Civil Beat. Neil Abercrombie pardoned more than 80 people during his single term as governor of Hawaii, with most of those actions coming after he lost the Democratic primary Aug. 9. A few pardons are still pending, but the current totals show that Abercrombie pardoned more people this year — 50 — than his Republican predecessor, Linda Lingle, who forgave 49 people for their crimes in her last year in office in 2010. Civil Beat. Some 37,000 Hawaii businesses will save $50 million in taxes next year due to a reduction in unemployment insurance contribution rates. The state Department of Labor and Industrial Relations said Monday it would cut by 22 percent the rate employers must pay into the Unemployment Compensation Trust Fund that distributes jobless benefits. Star-Advertiser. The unemployment insurance contribution rates for Hawaii employers will be reduced by 22 percent in 2015, or about $100 per employee, the state Department of Labor and Industrial Relations said Monday. Pacific Business News. A class-action lawsuit challenging the sale of Hawaiian Electric Industries to Florida-based NextEra Energy alleges that HEI's board undervalued the company. The suit also accuses board members of not seeking competing offers when it inked the multibillion dollar deal. Hawaii News Now. The Office of Hawaiian Affairs is appealing a ruling that its board violated the state’s open-meeting law during a dispute over CEO Kamanaopono Crabbe’s conduct. Associated Press. Federal Fisheries Group Uses Public Money to Lobby Against Protecting Fish. Wespac officials produced a glossy brochure and lobbied in D.C. but the cost to the public has yet to be revealed. Civil Beat. The embarrassing inflight outburst of a Korean Air Lines executive over the protocol for serving macadamia nuts has resulted in an unexpected windfall for Hawaii: a boom in macadamia sales. Star-Advertiser. Coast Guard law enforcement officers will once again enforce a temporary security zone in waters off Kailua Bay as President Barack Obama spends his annual Christmas vacation on Oahu. The security zone is scheduled to be in effect from 6 a.m. Thursday to 10 p.m. Jan. 5. Star-Advertiser. Hawaii's largest private landowner is asking the state Land Use Commission to designate nearly 10,000 acres on Oahu as important agricultural lands. Kamehameha Schools said Monday the land includes 421 acres in Punaluu and more than 9,100 acres on the North Shore. It also identified surrounding lands for processing facilities and farmer's markets. Associated Press. A small lei stand surrounded by luxury stores in Waikiki is struggling to survive. The owner is trying to carry on her family's legacy of sharing the Hawaiian culture with visitors. Hawaii News Now. A popular rock-climbing area known as Mokuleia Wall will soon reopen to the public after 2 1⁄2 years. The Board of Land and Natural Resources approved a month-to-month revocable permit Friday for the Hawaii Climbing Coalition, a nonprofit organization, to manage the basalt rock-climbing site. Star-Advertiser. The City and County of Honolulu is projecting the Leeward Coast to grow by more than 200-thousand people in the future. Today, the City dedicated a new district park financed by a major developer. Hawaii Public Radio. Malama Market, the anchor tenant at Pahoa Marketplace, will close Thursday as a result of the threat from the June 27 lava flow. The flow was approximately 1 mile from the shopping center Monday and could arrive there in seven to 10 days at its current rate, according to Hawaii County Civil Defense. Tribune-Herald. With the possibility of lava reaching a shopping center and gas station shortly before Christmas Day, Malama Market is planning to close. Star-Advertiser. Lava from a volcano on Hawaii's Big Island is on course to reach a shopping center with a gas station and a supermarket in seven to 10 days, officials said. Lava is about 1 mile from the shopping center in the small town of Pahoa, Hawaii County Civil Defense Director Darryl Oliveira said Monday. The shopping center also contains a hardware store, pharmacy and auto repair shop. Associated Press. With the lava flow again closing in on Highway 130 — the only permanent route in and out of lower Puna — county and state officials say they are continuing to assess the possibility of creating a road over the flow to maintain access to the region. Tribune-Herald. With lower sale prices and apparently more available properties, Central Maui is the county's hottest market for homes as the islands' still-recovering real estate market nears the end of 2014, statistics released by the Realtors Association of Maui show. Maui News. Some Kauai County Council members are defending a new rule that asks reporters and media organizations to provide a week’s notice to videotape or photograph one of their meetings. That rule, which was approved by the seven-member board nearly two weeks ago and included in their governing guidelines and procedures for the next two years, also includes a provision that allows Council Chair Mel Rapozo to assign spaces to reporters that do not interfere “with the convenience of the council or its committees.” Garden Island. A Kauai County Councilman says he would like to see state laws changed so more officials on the seven-member board can attend community meetings. Garden Island. The idyllic island of Kauai has become a playground for the ultra-rich. Kauai, known as the Garden Isle, has attracted in recent years more than two dozen billionaires and celebrities who are acquiring large swaths of mostly undeveloped land. Star-Advertiser.